Mitt Romney and Republican Party leaders have repeatedly and emphatically asserted that Obama and the policies of his administration have been terrible for private sector job growth, and that voters should therefore bring back the Republicans and their policies. Indeed, Romney has said his campaign is all about jobs. At the same time, they’ve asserted that government and its bureaucrats have exploded during the Obama years, with this holding back private sector job growth. But as the figures above show, private sector jobs have recovered under Obama, reversing the freefall that was underway as he was taking the oath of office, while government employment has contracted sharply. In contrast, private jobs were stable when George W. Bush took office, but then started to fall and fall sharply, while government jobs rose. By 38 months into his first term, there were 2.4 million fewer private sector jobs in the US economy than on the day Bush was inaugurated. Yet Romney repeatedly lambasts Obama for his jobs record, while he argues for bringing back the policies of Bush. They figures show the cumulative change in private and in government jobs between January of the year the Presidents were inaugurated, to the March that was 38 months (a little over three years) later. The March date 38 months later was chosen as that is the most recent date for which data is available for Obama. The data all come from the Bureau of Labor Statistics. The graph on government jobs is similar in presentation to that used by Paul Krugman in a posting on his blog yesterday. The government jobs issue was also reviewed in a posting on this blog site over four months ago, which noted the collapse in government jobs during the Obama years (while they grew under Bush), and discussed how this has hurt overall job growth in the economy. Private sector jobs were falling rapidly in the period leading up to Obama’s inauguration in January 2009, as has been discussed before in this blog (see in particular the figure at this posting). While the pace of decline was turned around almost immediately (within three months of Obama taking office), the number of private sector jobs continued to decline in Obama’s first year. But jobs in the private sector then began to grow, and by March 2012 (the most recent figure available) they are almost back to where they were when he took office. While this represents a growth of over 4 million private jobs over the past two years, the hole was a deep one. The economy was hemorrhaging 800,000 jobs per month at the end of the Bush administration. One would have of course wanted a more rapid recovery from this deep hole, but Republican opposition in Congress has blocked the measures that would have been needed to get this done (such as further stimulus). But while one would have wanted a more rapid recovery from the 2008 economic collapse, contrast the record of Obama with that of George W. Bush in the first term of his administration. Private jobs were growing in the final months of the Clinton administration, and were flat in the first two months of the Bush administration. But they then began to fall (with the fall well underway before the September 11 attacks, so one cannot blame them). The steady decline in private sector jobs continued for two and a half years, and at the trough there were 3.4 million fewer private jobs than when Bush took office. 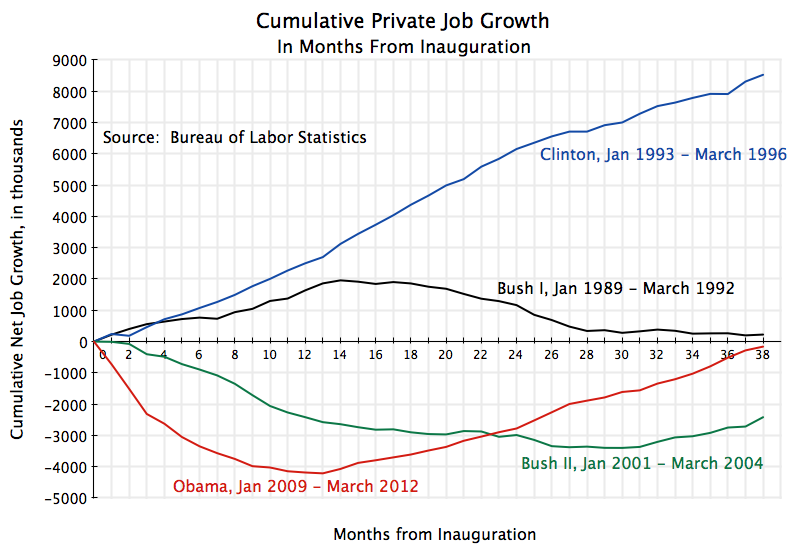 They then began a slow recovery, but by 38 months into his term there were still 2.4 million fewer private jobs than when Bush took the oath of office. Yet Romney and his economic advisors (most of whom held high positions in the Bush administration) advocate bringing back the policies of Bush. The graph also shows private job growth for similar periods in the Clinton administration and in the administration of the elder George Bush. Under the Democratic administration of Clinton, there was steady and strong private sector job growth throughout the period being followed here (and indeed throughout his two terms). Under the Republican administration of the elder George Bush, there was some, but weak, private job growth in his first year and a half in office, but then private jobs fell, so that by 38 months into his term they were close to where they had been when he started. Put another way, after one year in office up to the point 38 months into their respective terms, private jobs rose by over 4 million under Obama, but fell by 1.4 million under the elder Bush. The story commonly told about growth in government jobs under the different Democratic and Republican administrations is also a false one. Total government jobs have fallen during the Obama term, but grew sharply during the terms of both Bush administrations. They also grew during the Clinton period, although by less than in either of the two Bush terms. (Note that the sharp spike, and then after a few months a reversion to the previous trend, at a little over a year into both the Obama and first Bush administrations, is due to temporary hiring for the decennial census.) Keep in mind that government employment in the US is mostly state and local government employment, with federal employment only a small share (13% currently). But under Obama, non-defense federal employment has fallen as well (discussed in this blog posting). Positive government job growth during the Obama period, similar to that seen during the two Bush administrations, would have helped spur the recovery. But federal support which would have saved the jobs of teachers, police, and others has been blocked by Republican opposition, while cuts at the state and local level have been driven not only by deficit concerns but also by ideology. Indeed, prominent Republican governors such as Scott Walker in Wisconsin, Chris Christie in New Jersey, John Kasich of Ohio, Rick Perry of Texas, Rick Scott of Florida, and others, have celebrated their slashing of state and local government employment, often while cutting taxes at the same time. The job cuts have been unprecedented. The Republican stories on jobs are myths, and not consistent with the facts. Private sector jobs have recovered under Obama, and have grown by over 4 million jobs once the downturn Obama inherited was stopped. One would have hoped for a faster recovery, but further efforts to spur the recovery have been blocked by Republican opposition in Congress. And the story should be compared to that in the first term of George W. Bush, where there were 2.4 million fewer private sector jobs than when he took office, at the comparable point in his term. The story told about government job growth under the different administrations is also false. Government jobs have been slashed sharply (mostly at the state and local level) during the Obama period, which has hurt the economic recovery. In contrast, government jobs grew significantly under both Bush administrations, and grew but by somewhat less during the comparable Clinton period. 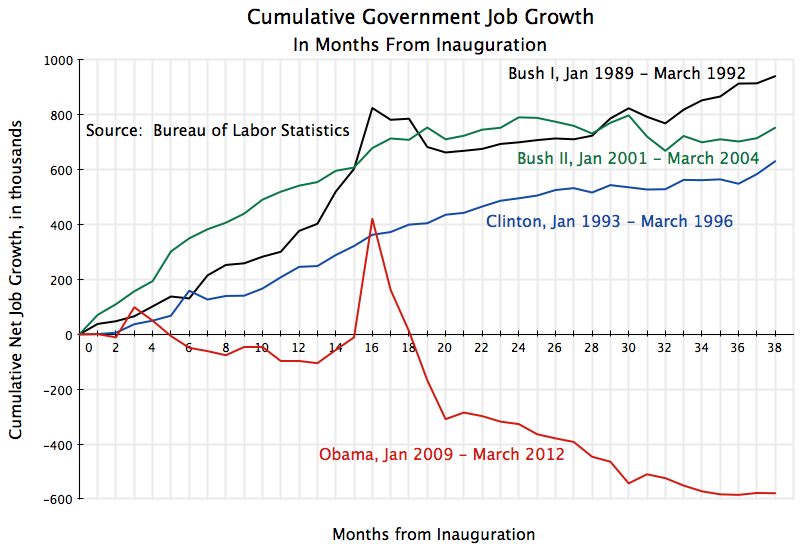 Positive government job growth during the Obama period, had it happened, would have helped spur the economic recovery. This entry was posted in Labor and tagged economic crisis, employment growth, government employment, jobs, private employment by aneconomicsense. Bookmark the permalink.